Signs of aging often appear first on our hands. Wrinkles, prominent veins, and age spots are hard to hide. Fortunately, there are procedures designed to erase wrinkles, age spots, and plump up the skin tissue so that hand surfaces look smoother and younger again. 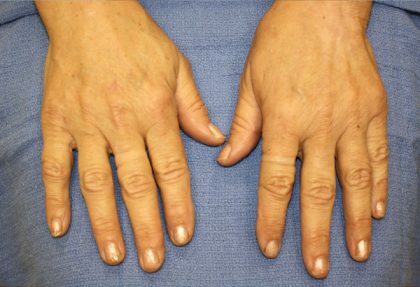 If many years of time in the sun or loss of the natural fat cushion has made your hands look older than you would like, there are ways to repair the damage. One of the most popular involves using Radiesse, a dermal filler, that is injected just under the skin. Radiesse is Calcium-based, lasts for 12 to 24 months, and provides an instant cushion replacement on the back of the hands. This fills in the gaps between the tendons and veins, making them less prominent and younger looking. This procedure is very fast and simple, producing results in minutes. 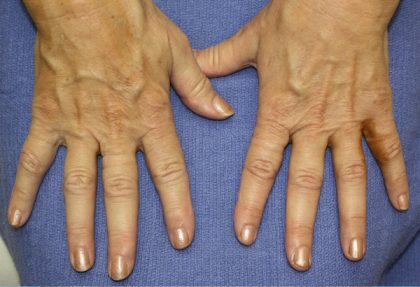 While it usually takes 2 syringes of Radiesse to change older looking hands to younger looking ones, there is little more than a brief “stick” as lidocaine is injected into the area to temporarily numb it. Dr. Zarrabi then injects several areas and spreads the Radiesse until it forms a smoother, more even surface on the back of each hand. Although it is not a “permanent” fix, the results of Radiesse are apparent longer than other dermal fillers available now.